Urns Through Time, A source of ceramic urns, funeral urns or funerary urns. Ordering. All Through Time Urns are custom made. That is they are hand-made one at a time specifically for each order. 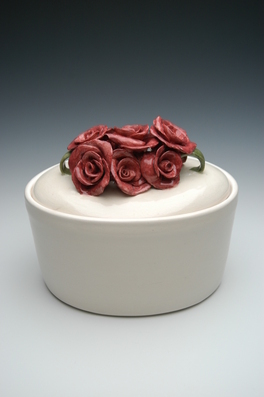 We do have some urns that were extra or prototypes that are available for immediate shipping in our Instock Gallery. For custom urns there are 3 levels of customizing. Note that many of the Level 1 Custom Urns are available for immediate shipping. At this level the basic difference is that you have a choice of shapes. There are currently two versions, Through Time Urns with Options which start at $119.95 and the Through Time Urns with Pedestal which has an added separately thrown pedestal at the base and start at $149.95. At this level the personal choice of a shape and color makes the urn you order truly yours. The highest level of customization is the Your Vision Through Time Urns which may be purchased for as low as $250.00 or $125.00 for Pet Urns. 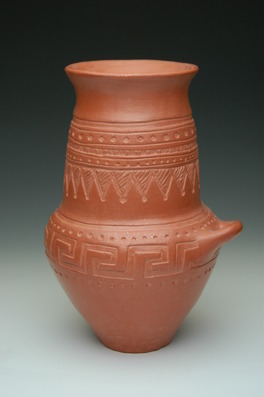 In this case you may choose something totally unique or you may want something similar to one of the Through Time Urns. For example you could choose the Ganesh Urn but change the colors and the arrangement of the images or make additions to make the urn truly personal. In either case you have complete control of the process and will work directly with the artist. Your can use your ideas and imagination and we can use our expertise to create the urn you want. We have created a deluxe cabin cruiser urn, an American Original slot machine urn, and a double dragon and tiger urn among many others. We are always open to original ideas.